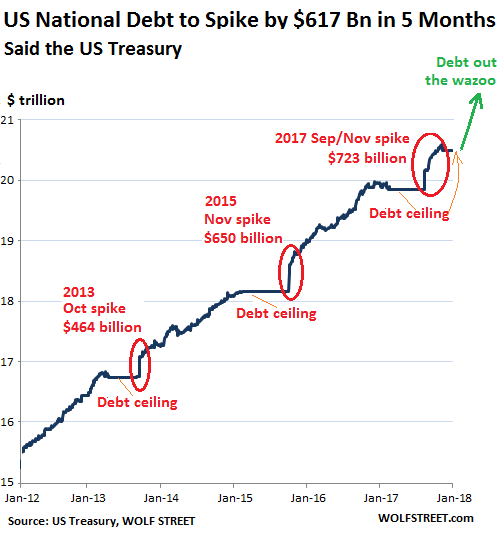 So over the next five months, if all goes according to plan, the US gross national debt of $20.5 trillion (which includes $14.8 trillion in publicly traded Treasury securities and $5.7 trillion in internally held debt) will surge to about $21.1 trillion. That’s right. This if the best-case scenario, if “everything goes according to plan. And what a plan! During Q2 – peak tax seasons when revenues pour into the Treasury – it expects to increase US public debt by $176 billion. The 10-year yield just hit a four-year high. Mortgage rates are rising. With the massive additional treasury supply, higher and higher rates will be required to pique new interest, and you can bet some beleaguered T-bill holders will see the writing on the wall, tap out, and move into gold.